I guess this story really starts last year. I did the draw applications and put in for the wrong side of this region. The deer here migrate north... and that's where we wanted to hunt but somehow in my mind I accidently put in for the Southern side. Sadly the DWR increased the number of tags on the south side so much that we decided to turn the tag in and not hunt. In retrospect it was a good idea as I know 4 people who drew the same tag and did not get anything as the weather didn't cooperate. So, by turning in the tag within the specified time period, she got her bonus points back and we got her properly put in for the North side, which she drew. Crazy she drew this the same year I drew my big elk tag... and my buck wyoming antelope tag. We prepared for the two big hunts, getting gear and gadgets, scouring maps, talking to people, getting advice etc etc. But finally the weekend of the arrived and we headed out friday early. Luckily my 15 year old boy who had planned to stay home during the hunt due to school, had a school holiday the week of the hunt so he chose to come out with us as he would only miss a few days of school vs a week. We got out there without any problems, set up camp and hung out for a bit as it was pretty hot still in the early afternoon. When it got to the point I thought the animals would get active, we broke out the atvs and went scouting for the next mornings hunt. We camped in the same area I had hunted in 2005. Right off the bat we started seeing deer... LOTS of deer. Lots of small yearling bucks and the occasional bigger 2.5 year old bucks. My boy was assigned camcorder duty... he didn't get all of the bucks we saw, nor even the biggest bucks we saw... but he did a good job overall and I was able to pull out some screen shots of frames of alot of deer. 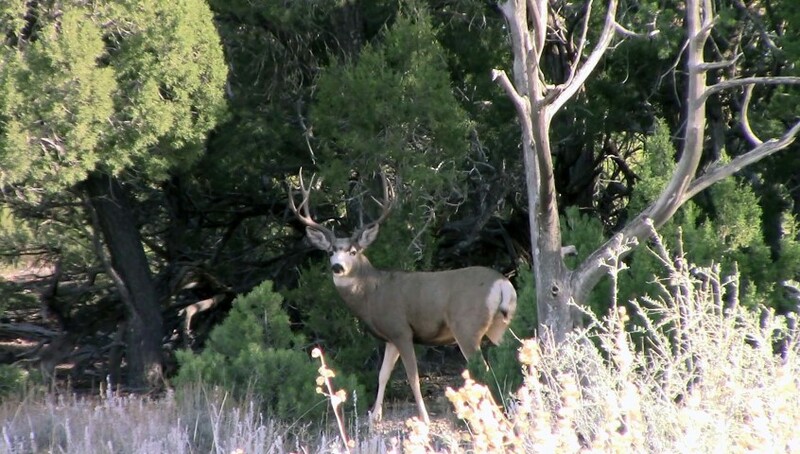 Here's the first 4pt we saw a mile from camp, the evening before the hunt started. I asked my wife if she'd shoot that one, she said no way. I said but its a 4pt... she again declined. I asked how it feels to be passing on bucks you wouldn't hesitate shooting in our normal hunting unit, she said its weird, really weird. Excited about seeing the 4pt we continued on. Both are non-typical. One was 5x6 (on a 3x3 frame), the other 4x5. The 5x6 had a similar genetic to the buck I got back in 2005. Sadly we looked for these bucks through the hunt (along with everyone else who saw them, but they disappeared). We continued on, seeing more small bucks with the occasional larger one thrown in. Amusingly when we ran into this guy, my wife said she would shoot it if we saw it again. Next morning, we saw him and she passed... we saw him every single time we went out, teasing, taunting her. At one point parked on a hill overlooking 200 does in a flat, he fed up within almost 100 yards of us. I thought it was pretty funny. Not a bad buck, just needed another years growth. We returned to camp for the night, and got an early start the next morning. Right off the bat we ran into this 4x3. She was tempted but decided to pass. 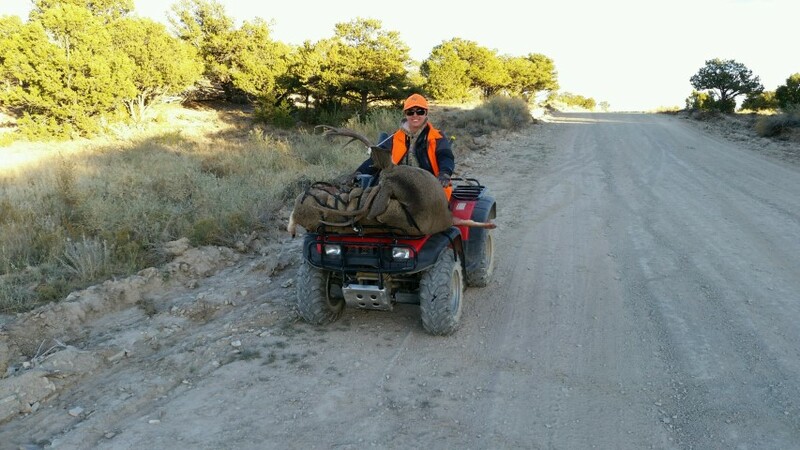 We saw a older gentleman ride past with this buck on his atv a few hours later. Ran into this guy 30 min later. She was on the fence with this one, but in the end decided this early in the hunt we'd keep looking. Alot of other hunters stopped and looked him over closely, all passed in the end. The small 4pt we saw the evening before she said she would shoot... ha, just kidding. We let him walk. End of day one, we saw hundreds of does and dozens of bucks. Enough smaller 4pts and 3pts we felt good we'd turn up something better. The next morning we returned to the same area and immediately started seeing more bucks, and new ones that hadn't been there the day before. Lots of yearling and 2yr old 3pts running around. Outlook is good for future years. We started driving through some roller coaster type hills, and in each valley there was a pocket of deer and a buck. It was amazing. We saw an awesome huge wide, heavy mature 3x4 that was really tempting. Sadly my boy didn't get it on video. We had him at 100 yards for a couple minutes, she was really torn on shooting or not but in the end hesitated long enough the buck took off and the choice / temptation got removed. She regretted shooting it throughout most of the day. We drove into the next ravine and saw this guy. He amused me greatly as he was one of the fattest deer I've ever seen... I mean literally his face was so pudgy! Never seen a deer like that before. It had odd antlers, not wide but going high. Near looking and unusual. Great genes for a yearling, he'll be a brute someday. By this time the sun was high enough animals moved off into thick trees. We went back to camp, ate lunch then took a drive in the truck to a couple different spots too far to ride ATVs to. We saw one tiny 2x2 so we returned to camp. After relaxing a bit, we decided to hit it again for the evening hunt. We left a little earlier than normal as we could see animals getting restless earlier than the prior day. As we headed down the trail to the area we planned to hunt that evening, we found this guy right off the road, 50 yards from us in the trees. Awesome! Clearly the older age class of bucks we were looking for. He stood there looking at us for a couple minutes as my wife was trying to figure out if he was "big enough". LOL! She had passed on the other big 3x4 earlier and regretted it... this one had a cheater split on the back tine of the 3 frame making him a 4x4. The eye guards were a nice addition. I estimated him at 25-26", a nice older mature buck. Before she could make up her mind, he wheeled and slipped back into the Juniper trees and was moving out. Here's the angle that decided it for her, as he looks wider from this angle. Here he is up close and personal. Nice big wide mature mule deer. The 4x3 frame is typical genetics for this area, lots of big 4x3s running around, most people pass for pure 4x4s (which are harder to find, hence people shoot younger bucks). Love the big heavy antlered look. Alot of people hold up a deer from behind, straight armed at the camera to make it look bigger. This angle shows he is plenty big and wide, and she is holding it to the side of herself, no need for camera tricks. 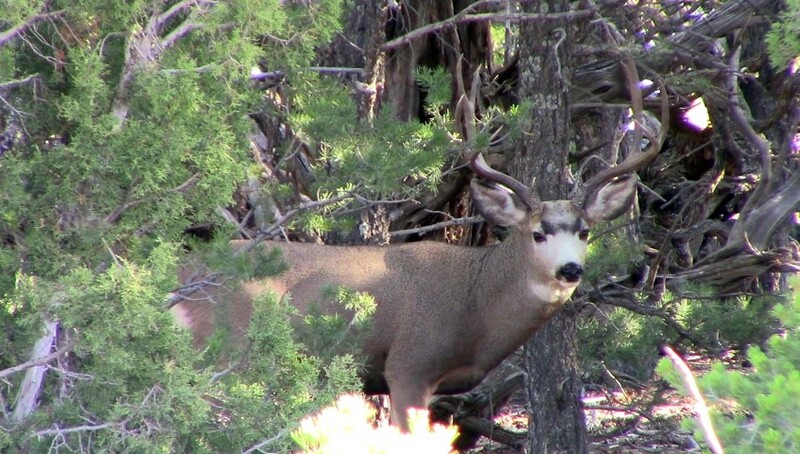 Gooood desert mule deer buck! We saw 30-40 bucks that day alone, and another 40-50 the day before with at least 400 does a day. Still all smiles when we got it loaded on the ATV... it was a grueling recovery to the ATV... all 50 yards of it on flat ground LOL! On the trip home we stopped at a DWR Game checking station, they measured him for their records and said it was the biggest buck out of that unit so far that year. Overall, a great fun time. Really glad we did it as a family, all enjoying the experience and building memories. We saw so many deer it was crazy, and in the end we found one she was happy to pull the trigger on. The only unfortunate thing is this unit is fairly hard to draw tags for. I loved hunting it in 2005, and my wife loved it in 2016... I just hope its not 2027 before my boy gets to do it. That is one very nice looking animal mate. SWMBO did well. Pass on my congratulations. Thanks for sharing, Dallan. Love the pictures. Congrats! Great family experience. Great story and great pics! Congrats! And thanks for sharing! Lovely lady and she hunts too. What more can one ask for in a mate. Jealous as hell!!! What a great job you did on the photos and story too. Looks like very nice weather. Rut started early here, saw some deer yesterday morning ghosting through the trees and that was the last day hunting for me. Never got a shot....nice to be out though. Congratulations on a great buck! That was great write up.. Thanks for sharing. lovely animal which is by my counting 4x4 or an eight pointer as any tine big enough to hold a wedding band is counted downunder.... lovely job on the camera,thankyou for shareing . Great pics and write-up. Seeing the pic of her buck looking back like that, I don't think I could have passed him up either! Beautiful. If you don't mind my asking, which unit were you hunting? Never hunted the Books. How long did it take you to draw? Ha ha ha! Yikes, I do not fall into that camp. Congrats on what looks to gave been a great hunt! Yeah $80 and a 10 year wait is better than $8k. My wife has 4 or so elk points so she'll jump into the ML Nebo Elk unit I drew this year. Maybe she'll get that in a few years. 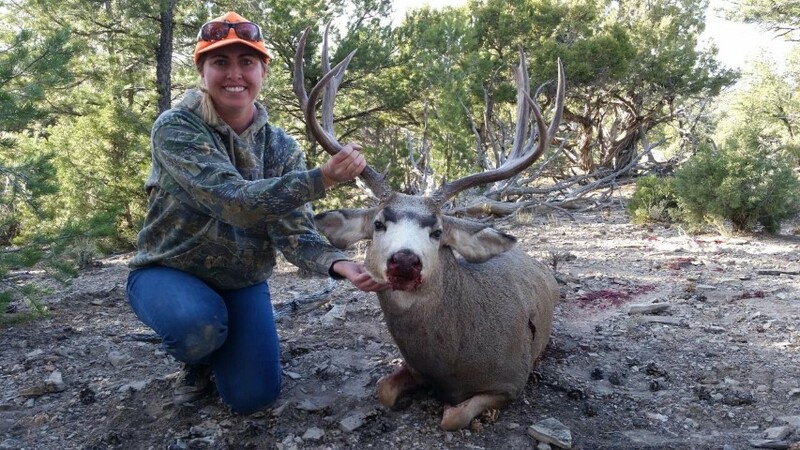 That is one fantastic Buck she got. Look,s surely like you folks had a great hunting trip. I have a question, does the meat taste like White Tail Venisen. Cause I,ve never tried these deer on my dinner plate ? I,m a newbie but a Senior hunting experienced newbie. Been hunting for over 40 years. And I still hunt deer.